During the early days of the Web, there wasn’t a standard font that could be rendered across all platforms. However, some fonts — like Arial, Helvetica, and Times New Roman — were more likely to be installed in a person’s computer. 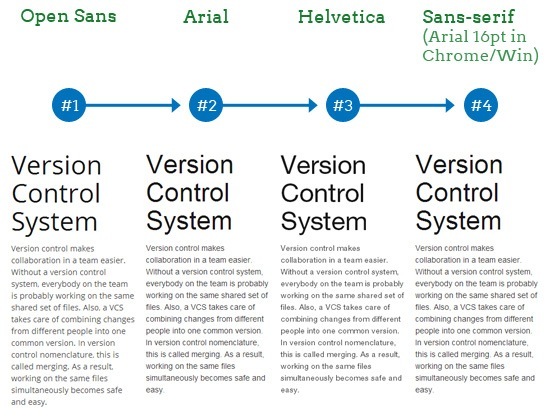 These popular system fonts are called Web-safe fonts. 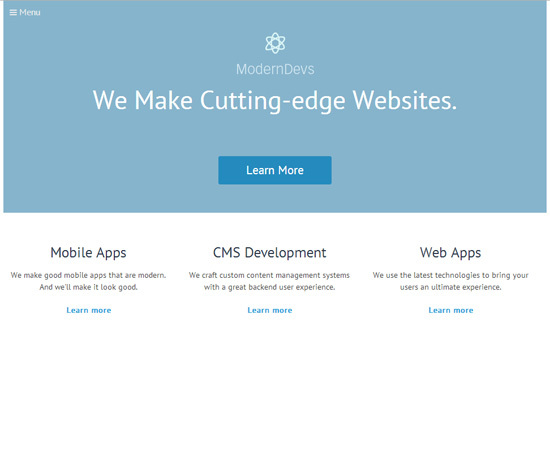 It was the best practice in web design to stick to them. Things have changed. It’s now safe to use Web fonts — a technique for rendering any remote font file in a web page using @font-face. 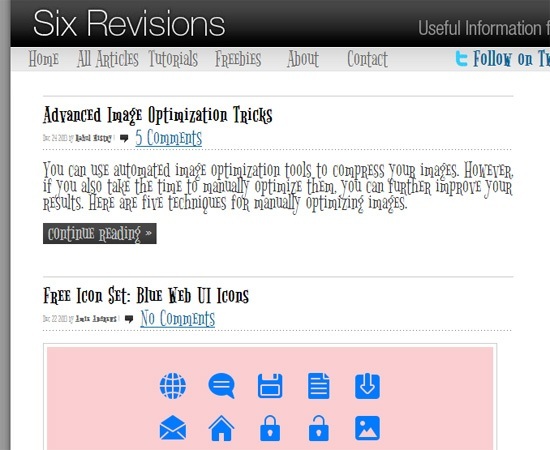 This give us more creative freedom and a much wider range of font options. 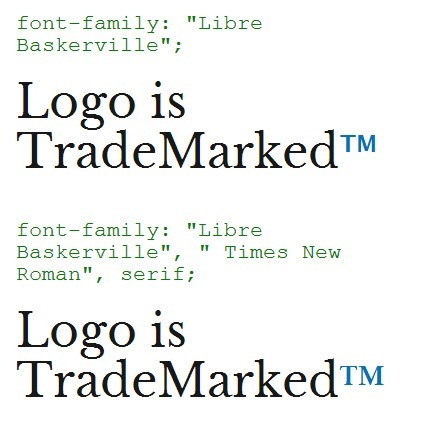 The @font-face rule has been around for close to 13 years, first seen and supported in Internet Explorer 5.5. And @font-face has been formally included in the most recent version of W3C’s CSS standards (CSS3) — it was taken out in CSS2.1 — and so modern browsers (e.g. Chrome, Safari, IE, and Firefox) support the rule. But even with near-perfect support of the @font-face rule, as a good practice, we should still use CSS font stacks. Moreover, our CSS font stacks should still include Web-safe fonts as well as generic font families like sans-serif and serif. As shown above, using a good font stack assures us that we are gracefully degrading our HTML text in case our chosen font is for some reason unable to load. Web-safe fonts and CSS font stacks seem like outdated Web design practices, especially since @font-face has great support. Right now close to 90% of the Internet’s users use a browser that supports @font-face. But if you’ve ever considered dropping your CSS font stacks, below are a few reasons that might change your mind. If certain characters in your font are not available, the browser will attempt to render those unavailable characters using the next font in the stack. But if you don’t have a font stack, it will use the browser’s default standard font. For instance, the Libre Baskerville font doesn’t have the ™ character. At least with a good font stack, the ™ character looks similar to the preferred Libre Baskerville font. Loading a remote font using @font-face requires an Internet connection. If the web server responsible for serving the font is unavailable or is down for maintenance, the browser will use its default standard text, unless you specify a Web-safe font in your CSS font stack. For Google Chrome, the standard text (on Windows) is "Times New Roman". This can be bad news if we were using a sans-serif font, and the web server or the content delivery network where the font file is located goes down. The web page looks completely different because Times New Roman greatly affects the visual message of the design. But if we used a font stack that included Web-safe fonts, we can mitigate some of the aesthetic issues that come with network problems. Some web browsers provide the option to disable the downloading of font files. 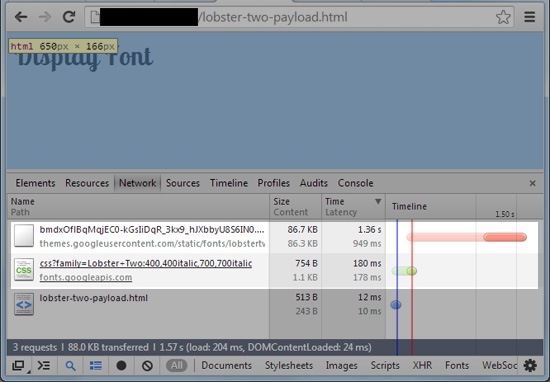 In most cases, disabling remote font files in a web browser is obfuscated, but it’s possible. Here’s a forum post for turning off remote font downloading in Firefox and Chrome, and here’s one for Opera. Why would someone want to disable remote fonts? To speed up web page load times, which is especially desirable for Internet users who have slow Internet connections. 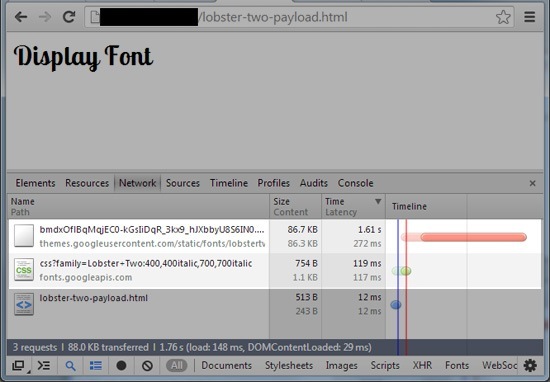 To illustrate how Web fonts impact Web performance, let’s use a display font such as "Lobster Two". The test conditions are a broadband Internet connection and an unprimed cache (meaning that the browser cache was cleared for each test). In the condition tested, it would take an average of 1.3 seconds to render the <h1> tag fully for someone who has an unprimed cache. This means staring at a blank page for 1.3 seconds before the user can read the text, because Chrome’s default behavior is to show no text while the font is still loading. Consider that 1.3 seconds is the average load time using a broadband connection to download the font files from Google’s servers. Imagine how long it would take in less-than-ideal situations, such as slow mobile networks and using a shared-hosting server to serve the font. Without the Web font, the same document would finish rendering in an average of only 0.012 seconds, which means the font increased the load time by 10,733%. That is a hefty price to pay for rendering a novelty display font that’s not functional enough to be used for critical website content. That’s why some users choose to disable remote font files from loading. If we want to gracefully degrade our web design in situations where the user has chosen to disable remote font files, we should use Web-safe fonts in our font stack. It must be noted here that you don’t have to load the entire font family. And if you use the Google Font service, you can selectively load just the font variations you need. Though it’s rare, @font-face isn’t supported in a few web browsers, especially old ones. Earlier, I mentioned that 90% of Internet users use a browser that supports @font-face. Not having a font stack that includes Web-safe fonts and a generic font family means that we aren’t controlling how our web design degrades for at least 10% of the Internet’s users. The time and effort required to use a simple CSS font stack that includes Web-safe fonts is very small, so there’s little reason not to continue doing it. The SitePoint CSS reference for @font-face has a table showing @font-face as being supported in Internet Explorer 5.5+. According to The Can I use @font-face Web fonts compatibility table, 89.84% of the Internet population uses a browser that has full or partial @font-face support. This data is from StatCounter Global Stats, November 2013. 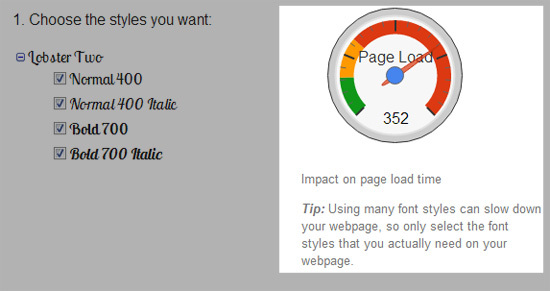 See the description of the browser-specific Web font rendering behaviors on the Google Developers site. This is outdated because as of Firefox 4 (officially released March 2011), loading Web fonts now behave similar to WebKit-based browsers.